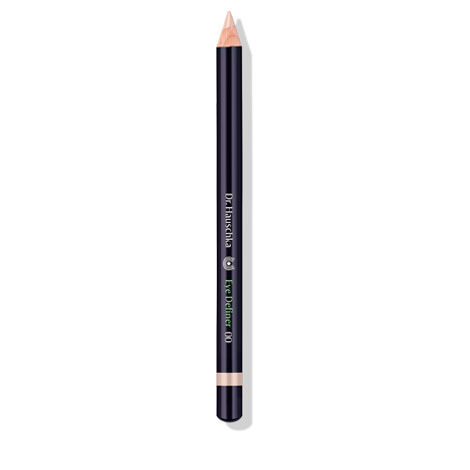 I was very excited to try this eyeliner as I have for many years used a white eyeliner on the inner rims of my eyes to disguise the pink as I always feel that my eyes look sore without the liner. However, I was always concerned that I couldn't get an ethically produced white liner and also, the fact that I will soon be fifty, felt that the white may eventually start to look a bit harsh on me. This eyeliner fits the bill. It is obviously not as noticeable as the white one I was using previously but does naturally cover the pink on my inner rims and enhance my eyes. It is very creamy to use, not at all scratchy, yet seems to be lasting well without having to be sharpened constantly. The most important thing is that it has not irritated my sensitive eyes. It's a little more expensive than what I would normally pay for an eyeliner, but seems worth the money and I would definitely purchase again once this one has run out. I was super keen to try this eye definer as I’ve never used a product like this before and I wanted to see how awake I could look! I was so impressed.